2010 had been something of a watershed. 25 years and significant change in management of the Ride. However new chairman Jon Tawse and committee which contained a number of new faces organised an innovative ride which all who took part seemed to thoroughly enjoy. 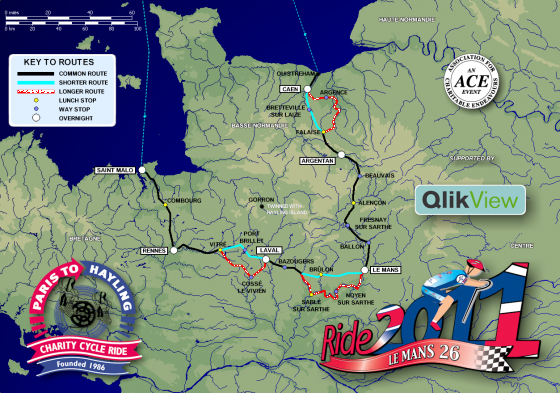 The route took in some of the 2009 ride, heading from St Malo to Rennes and then on to Laval but rather than then making for the Loire valley, riders headed north east to Le Mans and then on to Argentan before the last night in Caen. In 2010 we introduced short and longer options on several days. This idea, which some were a bit nervous about, worked really well. At certain points on selected days riders simply had to make a choice between taking the long route or the short one. A simple but effective way of catering for riders of varying abilities and/or ambitions. Another first was having two social evenings – not just the last night party (in Caen Castle of course!) but also one mid-week in Le Mans. In both cases our very own bike ride band The Kings of Le Mans entertained superbly. Some of the new route proved very popular particularly in the Sarthre valley north and south of Le Mans with the scenery proving comparable to that in the Loire valley.